Bucky is my 10 year old puppy! In February of 2013 I had to send my dog, Cody, of 13 years, to the Rainbow Bridge. For over a year I had been trying to adjust to my disabled status after working as an RN 39 years. Was in full blown depression and cried everyday for my best friend. Finally I reached out for a new fur friend. 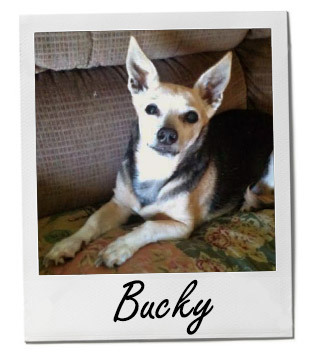 Bucky came to live with me on March 10th, 2013! A little fur kid lifted me out of a devastating depression. Now not only do I have Bucky, but this year I adopted another 10 year old boy, Ace and a cat named Morris. We have a happy home! I call this pic of Bucky, 'the look of love'!